← Why Are Americans So Obsessed With The Perfect Smile? When many adults think of braces, they think of middle school, of food getting stuck in the brackets, of a smile full of metal. In the adult world, braces don’t always seem to fit. They’re a time-consuming process, often painful, and sometimes an eyesore. But orthodontics aren’t just for preteens – in 2014, adult orthodontics patients totaled nearly 1.5 million. It’s clear that adults need orthodontic care too, but braces are not always a feasible option. Invisalign might be the solution for orthodontics for adults. Invisalign presents an option to those who cannot or do not want to go the traditional route with braces. 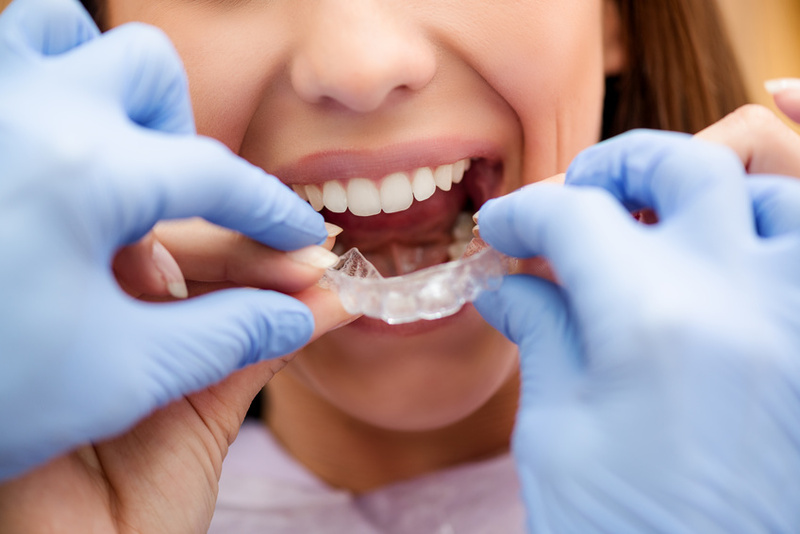 Patients have clear aligners custom fitted to their teeth, specifically designed to move teeth to their optimal positions. The aligners are switched out typically every week under a treatment plan devised by the patient’s dentist or orthodontist. It’s comfortable. Invisalign aligners are removable, taking the stress of food restrictions out of the picture. Invisalign is made from pliable, durable material that doesn’t pose the same risks that traditional brackets do. It’s safer for contact sports and more comfortable for everyday life. It’s practically invisible. Without traditional brackets, Invisalign keeps you looking professional in the workplace and the world. It treats a number of different orthodontic problems, from crowding to gapped teeth to overbites. People love it. In fact, 96% of patients report satisfaction with Invisalign. Invisalign offers an alternative to traditional braces without sacrificing results. With its comfort, near-invisiblity, and short treatment time, it’s a clear path to a better smile and greater confidence.